A neighborhood plan for Dutchtown, Gravois Park, and Benton Park West. The Gravois Jefferson Plan has been adopted! The Gravois Jefferson Historic Neighborhoods Plan was adopted on May 2nd, 2018. Working together on a vision for Benton Park West, Gravois Park, and Northeast Dutchtown. The Plan Has Been Adopted! The Gravois-Jefferson Historic Neighborhoods Plan was unanimously adopted by the City of St. Louis Planning Commission on May 2nd, 2018. Thank you to everyone who was a part of this process to help make this happen, and we will continue to update you with details on implementation activities around the planning effort. The work isn’t done, it’s just beginng. 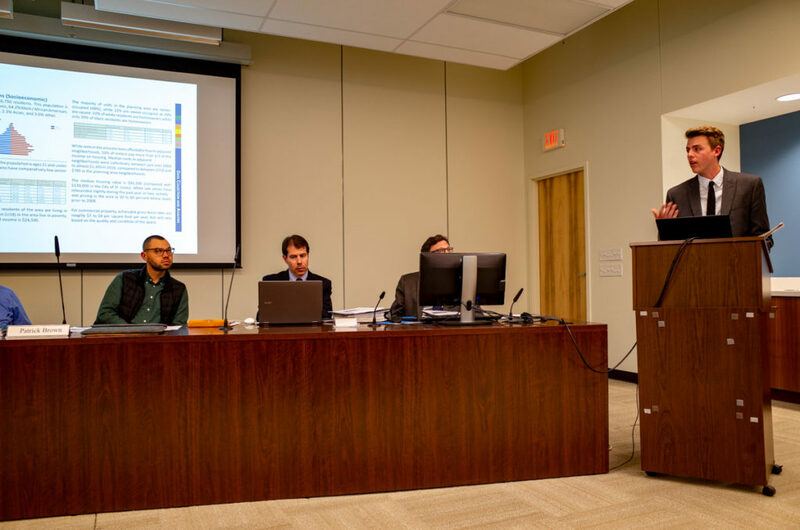 Rise Project Manager Carrick Reddin Presents the Gravois Jefferson Plan to the St. Louis Planning Commission on May 2nd, 2018. Click here to download the plan in PDF Format (45mb). To download the plan in high resolution or other layouts, please click here. The Gravois-Jefferson Historic Neighborhoods Planning process gives residents a say in how their neighborhood will look for years to come. This effort, undertaken by Rise Community Development in partnership with Dutchtown South Community Corporation, aims to gather input to produce a single community plan that will cover the area bordered by Jefferson to the east, Gravois and Grand to the west, and Meramec to the south. It encompasses Benton Park West, Gravois Park, and a northern portion of Dutchtown. Working with elected officials as well as the City of St. Louis Planning department, the final plan will be incorporated into the city’s overall plan, as a tool to help drive investment in the neighborhood for years to come. The process is driven by a steering committee of identified community leaders who guide how we move forward with this process. Dutchtown South Community Corporation is leading the Community Engagement, gathering feedback and help making sure this plan represents the needs of the community. With their years of experience working in the area and an existing rapport with the community, Dutchtown brings many valuable assets to the table. Learn more here. Rise will build on the efforts and feedback collected by DSCC and turn it into a real neighborhood plan. Their team of urban planning and community development professionals brings a wealth of institutional planning knowledge to the table when it comes to producing planning results. They are responsible for the final project outcomes and getting a plan before the Board of Aldermen for approval in Summer 2017. With the support of the three members of the Board of Alderman who represent the area, the city planning department, and other stakeholders, our end goal is for the plan to be adopted as part of the city's planning framework. This separates the Gravois-Jefferson plan apart from other neighborhood plans which do not have the official backing of the city.